They are beginning to look like the walking wounded and it has only been one week since training camp has kicked off at Leigh. In the first two full days of contact practice, the Eagles have seen Mike Bell, DeSean Jackson, Stewart Bradley, Asante Samuel and A.Q. Shipley go down with injuries. Today was no different, as three more Eagles became part of the ever-growing injury club. After taking a vicious shot to the head, defensive tackle Antonio Dixon was sent to the locker room and was escorted inside the facility. Defensive back Macho Harris became the third Eagles player to tweak his hamstring in the past three practices. He is not expected to miss much time, which is great since before he left the field was making plays at corner. However the most serious and concerning injury of the day had to be starting guard (use the term loosely) Stacy Andrews. Andrews missed the afternoon practice with a shoulder injury. Mike McGlynn filled in for him on the line. Currently the Eagles are already down two starting offensive linemen in Todd Herremans and Jamaal Jackson. This means that only tackles Jason Peters and Winston Justice are the only starters at their natural position for the club (Nick Cole has played two games at center since being signed as an undrafted rookie. Also Justice had a very bad practice today.). For the Eagles, the injuries along the line are beginning to pile up, which is not good with the superb pass rushers of the NFC East. Even more concerning for Eagles then just missing three starters on the O-line isAndrews still has never been fully healthy in an Eagles uniform. Furthermore fans are starting to think Andrews is beginning to turn into his brother Shawn. He is quickly becoming a player who does not like play through the pain and is consistently injured. The Eagles and their fans are accustomed to offensive lineman like Jon Runyan, who would play through a torn muscle or broken tailbone. Of course fans should not be too harsh since there is still over a month away from the first game of the season. Still it is not a good sign that Andrews is not on the field with a bad shoulder. 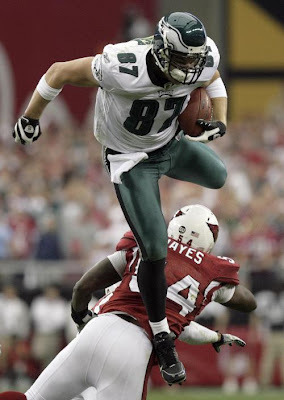 * One injury that had fans and trainers worried in the morning practice was starting tight end Brent Celek. Celek left the morning session complaining of lack of breathe. As it turns out, Celek had the same problem that Max-Jean Gilles had yesterday, which was dehydration. Trainers hooked up IVs to Celek and he returned for the afternoon session. * Yesterday, middle linebacker Stewart Bradley missed practice with hamstring spasms. Today, he was back at the afternoon session where he participated in the installation portion of the practice and then went back to working out with the rest of the walking wounded. * TE Martin Rucker left the field in the morning practice with an undisclosed hamstring injury. Two days ago, the Eagles dropped undrafted rookie WR Jared Perry in order to sign free agent WR Kelley Washington. 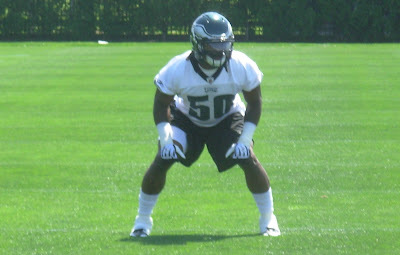 Today, the Eagles decided to bring back Perry and release undrafted rookie free agent DE Eric Moncur. It should be noted that Perry's time in Bethlehem might be short lived. As soon as DeSean Jackson and Jordan Norwood return from their injuries, he is likely the odd man out. * Joselio Hanson took a large portion of the snaps in practice at the starting cornerback position due to Asante Samuel sidelined with a strained hamstring. However as the Eagles went from their normal 4-3 base defense to their Dime package, he was moved back into the slot. This says a lot about Hanson and what the Eagles think about him. This shows that Eagles covet Hanson’s ability to cover the slot receiver. It is telling that the Eagles would move him back inside and not try Harris, Trevard Lindley or Patterson (actually moved to outside when Hanson slid in). *In a very interesting move, defensive coordinator Sean McDermott lined up outside linebacker Moise Fokou at defensive end. Maybe he is trying to just simply add a wrinkle to the Eagles defense, but Fokou is greatly undersized to play the line. This was on full display against Dallas last year. Additionally, it is the second straight day that Akeem Jordan practice with the first unit defense at the SAM linebacker position. It was assumed it was Fokou's job to lose at the end of last year, but maybe the Eagles are worried about Fokou inability to be stout against the run. Or it could be his uncanning ability to draw a yellow flag, which he did today by grabbing the facemask of WR Jason Avant. * The best and worse news of the day might be Brandon Graham creating chaos in the backfield. The good news about this is that Graham abused right tackle Winston Justice and is demonstrating exactly why the Eagles traded up for him. In just the afternoon practice, Graham nearly picked off a ball, got to the quarterbacknumerous times and broke up shovel pass. Now the bad news, no one was wearing pads and Justice was the one being owned. Not only did Graham make him his whipping boy, his presence contributed to two of Justice's false start penalties. Ultimately it forced Andy Reid to replace Justice with King Dunlap. The Eagles already down three starters along the O-line and need Justice to step up his play. Regardless, it is good too see Graham rising to the occasion. While Juqua Parker is still starting with the base 4-3 defense, but he might not be for long. 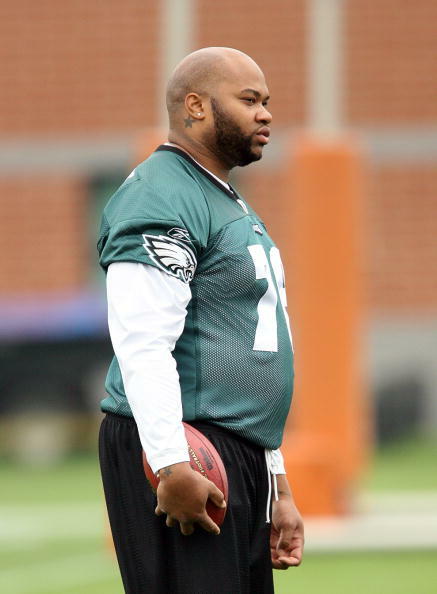 * Over the weekend, the Eagles signed veteran WR Kelley Washington. While everyone knew he could make an impact on special teams for the Eagles, he has been wowing the coaches with his hands and big play ability as a wide receiver. In the morning practice it seemed like Washington transformed from a journeyman receiver to Larry Fitzgerald. He caught everything thrown his way even if it was under or overthrown. If he continues to play this well, he might overtake the incumbent Hank Baskett (make him expendable) for the No. 4 receiver spot. * Also in the bad news department, recently acquired running back J.J. Arrington looked an awful lot like Lorenzo Booker. In the morning practice he fumbled the ball then dropped a pass on the very next play. This is not the way to start your career with the Eagles. With one spot open at running back, rookie Charles Scott could have the upper hand. * In Detroit, Ernie Sims was declared a bust. So far with the Eagles he looks like he could have been the steal of the offseason. He is flying to the ball and making plays with his athleticism. On consecutive plays, he blitzed from the outside and got to the speedy Michael Vick. The very next play, he nailed Hank Baskett in coverage. However, Sims needs to remember that these are his teammates. He nailed LeSean McCoy after the whistle, which was his second late hit since contact drills started. * Perhaps the position with the most amount of question marks is the starter opposite of Asante Samuel. Ellis Hobbs has been taking a good portion of the snaps in order to get him prepared for the 2010 season. This is a good thing since he rarely participated in the team's offseason OTAs. Hobbs is learning more and more with each play. One play he was burned by Jeremy Maclin, but later in practice Kevin Kolb called the same route. He was draped all over Maclin, which made Kolb to deliver the ball elsewhere. On the plus side these guys won't be getting injured in meaningless pre-season games.